After being very successful with your Magento e-commerce store on web, it's your turn to tap the amazing potential of M-commerce. Our Magento Mobile apps development services take your Magento store to leading mobile platforms Android, iOs and Blackberry. The rapid growth in numbers of smartphone users is opening up opportunities for merchants to bring their business to mobile users. Our Magento mobile apps are perfectly synchronized with your Magento website. That means, your users will enjoy similar users experience on either versions of your online store. BrainPulse, a leading mobile apps development company is offering a way to transform your Magento website into a Magento mobile store seamlessly. We develop both hybrid and native Magento Mobile Apps for all the major mobility platforms notably Android, iOs and Blackberry. 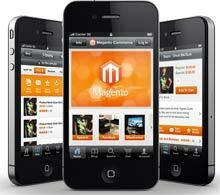 Magento offers the simplest and fastest way of creating Magento mobile apps using Magento Mobile App Extension. The platform gives easy-to-manage tools and customization options to develop mobile apps for Android and iOs the way you want. Its easy navigation and great UI design make your online store look even better. With Magento, merchants get the flexibility to create the ultimate customer experience. Native or Hybrid Mobile App: Which One To Choose ? Don't be trapped in dilemma, either modes of mobile apps are equally significant. Your choice of mobile app type depends upon three key parameters namely the quality of the experience you want to deliver to your audience, the complexity of the features the app has and the budget you allotted for the app development. What Makes Magento Mobile App Extension So Popular ? Multiple platform support for both Android and iOS platforms. Easy integration of your Magento commerce store with your shopping app. Features and functionalities to manage user accounts. Collection of elegant themes to choose from that suits your brand. Push notifications to send latest updates, offers and discount coupons to your customers. Plug-ins that support default Magento and third - party shipping methods. BrainPulse has years of experience in developing M-commerce apps on various platforms including Magento. Our team creates and configures M-commerce version of your online store and allow you move seamlessly between the web store and mobile store. Our dedicated developers develop fully customized mobile app that looks like a mobile store your always wanted to have. Developing Magento mobile apps require the right kind of development skills and expertise, and thankfully we have that sort of experience and a team that delivers. To know more about Magento mobile apps development services, call our business development execuive at 0120-6790400.